In late October 2011, DARPA (Defense Advance Research Projects Agency) issued a challenge to computer scientists with a $50,000 reward if they could reconstruct shredded pages of paper. The following excerpt from the DARPA Shredder Challenge website describes the competition. Today’s troops often confiscate the remnants of destroyed documents in war zones, but reconstructing them is a daunting task. DARPA’s Shredder Challenge called upon computer scientists, puzzle enthusiasts and anyone else who likes solving complex problems to compete for up to $50,000 by piecing together a series of shredded documents. The goal was to identify and assess potential capabilities that could be used by our warfighters operating in war zones, but might also create vulnerabilities to sensitive information that is protected through our own shredding practices throughout the U.S. national security community. The Shredder Challenge was comprised of five separate puzzles in which the number of documents, the document subject matter and the method of shredding were varied to present challenges of increasing difficulty. 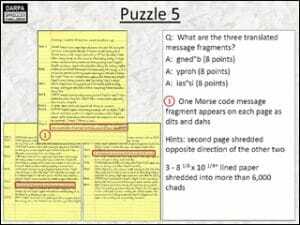 To complete each problem, participants were required to provide the answer to a puzzle embedded in the content of the reconstructed document. The Challenge began on October 27, 2011 and concluded on December 2, 2011 after all five puzzles were successfully solved by a team of three computer programmers from San Francisco.